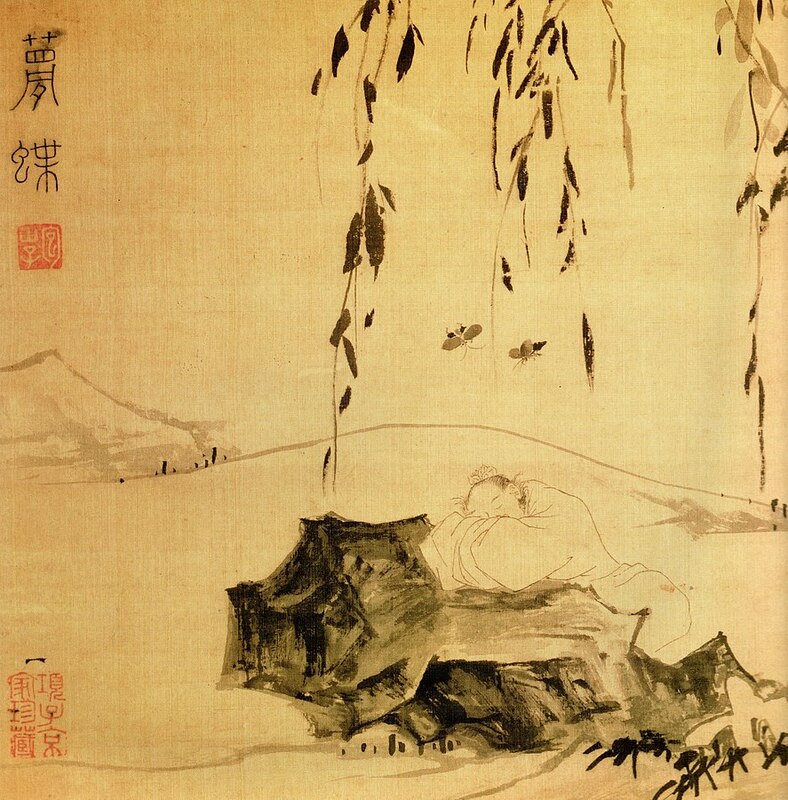 Zhuangzi Dreaming of a Butterfly, Ming dynasty, mid-16th century, ink on silk. Source: Wikimedia Commons. Abstract: As the delivery of health care in China undergoes change, novel forms of "classical" Chinese medicine are emerging through marketization, entrepreneurship, and the new knowledge economy. Young practitioners, entrepreneurs and advocates engage in clinical, pedagogical, entrepreneurial and other outreach activities outside of state-run institutions. These new approaches to classical Chinese medicine, which focus on Daoist analytics through close engagements with classical texts and herbal formulas, are not attempting to restore spirituality to the scientized and secularized theory of traditional Chinese medicine, nor are they representative of efforts to withdraw from the modern world. These "cosmographic experiments," I suggest, need to be understood in relation to dialectical and historical materialisms as modes of knowledge production and political alliance. In questioning the status of materialist theory and the process of theorization in traditional Chinese medicine, and in postsocialist life more broadly speaking, classical Chinese medicine advocates imagine nondialectical materialisms as immanent ways of thinking, doing, and being in the world. In The Protestant Ethic and the Spirit of Capitalism, Max Weber famously argued that Western religions are transformative and their Eastern counterparts are contemplative (Weber  1992). On the one hand, otherworldly callings materialized in the Puritans’ this-worldly commitment to building a modern economic order, the emergence of the capitalist "spirit," and the rise of rationalism and intellectualism. On the other hand, followers of contemplative religions, and especially Daoism, as Weber argues in his subsequent volume, The Religion of China: Confucianism and Taoism ( 1951), are trapped in otherworldly mysticism. Within the this world/other world scheme, "medicine and pharmacology" (a reference to herbal medicine) is one of the few ways Daoists reenter this world—nevertheless, with a catch. Daoists do so only through "a superstructure of marginally ‘rational’ science" that "cloaked the simple empirical skills" and "consisted of chronomentry, chronomancy, geomancy, meteoromancy, annalistics, ethics, medicine, and classical mantically-determined statecraft" (ibid., 199; see Zhan 2018 for further discussions). The challenge we face, as I see it, is not having to come up with a better or bigger theory, but rather taking the politics of imagination seriously and coming up with—and staying with—alternative accounts of worlds-in-making. What makes it possible and acceptable for Weber to construct a sweeping view of contemplative Chinese "religion," which then served as the perfect foil for the transformative "spirit of capitalism"? One might argue that colonialism was holding the world hostage, and armchair social science was the norm. But this argument is no excuse, nor is it an outdated mode of Eurocentric theory making that can be safely swept under the carpet of social and academic history—not at a time when rationalism and modernist discourses of bifurcation continue to undergird humanistic inquiries. As I argued elsewhere (Zhan 2012), the worlding of such theories—or rather, Theory itself—entails the violent unworlding of other ways of thinking, doing, and being which renders them unimaginable, unthinkable, and undoable. The challenge we face, as I see it, is not having to come up with a better or bigger theory, but rather taking the politics of imagination seriously and coming up with—and staying with—alternative accounts of worlds-in-making. This essay is an experiment in co-imagining immanent worlds that do not easily succumb to the modernist "this world" and the "other world" divide. To do so, I think alongside the story of the emergence of a new kind of "classical" (古典) or "ancient" (古) traditional Chinese medicine through entrepreneurial practices in cosmopolitan China today. Self-consciously positioning themselves "outside of the establishment" (体制外tizhiwai), advocates and entrepreneurs of classical Chinese medicine often distinguish themselves from the secularized, standardized, and scientized Traditional Chinese Medicine (or "TCM," which was institutionalized in the 1950s). Some of the most experimental and inspired efforts in exploring classical Chinese medicine have come from practitioners, entrepreneurs, students, patients, and grassroots activists working with and within a small but extremely vibrant cluster of privately owned and operated academies, clinics, membership clubs, and online and offline forums in metropolitan areas. In contrast to generations of "old Chinese doctors" (老中医 laozhongyi) whose seniority and longevity alone are often perceived as a guarantee of empirical knowledge and clinical expertise—or, conversely, as a sign of quackery scoffed by professionals and lay people who object to the idea that Chinese medicine is in any way scientific or therapeutically effective—many of those spearheading classical Chinese medicine are defiantly youthful. Most were born during or immediately after the Cultural Revolution (1966–1977) and came of age during the market liberalization in the 1980s and 1990s. In everyday pedagogical, clinical, social networking, and entrepreneurial practice, they purposefully read, discuss, and practice classical texts and analytics—in particular, those excluded from TCM for having religious, spiritual, or superstitious connotations (周易Zhouyi, 八卦bagua, etc. ), and those retheorized through the scientistic framework of dialectical and historical materialisms (e.g., the theorization of 阴阳yinyang as a dialectic and, to a lesser extent, 五行wuxing—the "five elements" or "five phases"—as primitive materialism) (Zhan 2016). This essay is an experiment in co-imagining immanent worlds that do not easily succumb to the modernist "this world" and the "other world" divide. This new classical Chinese medicine is not content with absorbing piecemeal information or abstracting theory from ancient texts into the orbs of dialectical materialism, nor does it delineate the progress of traditional Chinese medicine within the developmental scheme of historical materialism (Zhan 2016). Suspicious of scientism even though deeply enmeshed in and indebted to it, proponents are emphatic that classical Chinese medicine is much larger than "medicine" and must be reimagined and animated as an immanent "way" or "method" (the "dao" in Daoism) to inhabit mundane and profoundly disharmonious worlds and lives. The aim of the movement is to bring medical knowledge, experience, and practice—including business and entrepreneurship—back within the folds of everyday life as "thoughtful practice" (修行). Like Marxist dialectical and historical materialisms, then, the classical or the ancient is very much alive as a resource for thinking, doing and being in the present. In this essay, I think alongside the experiments in classical Chinese medicine that defy ready-made analytical categories of secularism, science, religion, socialism, postsocialism, capitalism, East and West, and modernity. Contrary to Slavoj Žižek’s claim that Daoism (along with Buddhism) works as "the opium of the people" through which our innermost self becomes ensnared in the false consciousness of inner peace and harmony, and thus alienated from global capitalist dynamics (2014, 66), the emergence of classical Chinese medicine at the margins of the establishment articulates critical worldly imaginaries and commitments that push against rationalization or resist the temptations of transcendence. The rise of classical Chinese medicine is irreducible to religious revival, the triumph of a distinctively Chinese ontology, or a function of universal capitalistic logic in which religion, spirituality, and mysticism sell as attractive commodities (even though they do sell, sometimes) (Zhan 2016). Unfolding within the interstices of the Modern, experiments in classical Chinese medicine unsettle some of its most deep-seated assumptions. They challenge a modernistic and imperialistic chronology and geography deceptively premised on radical breaks: the invention of the sciences, the secularization of society, and the mechanization of the world (Latour 1993). In contrast to Weber’s observation that "the path to God" (quoting the Dutch biologist and miscroscopist Jan Swammerdam, "Here I bring you the proof of God’s providence in the anatomy of a louse") is blocked by rationalism and intellectualism in our disenchanted times ( 1946, 8), and that our hopes for emancipation from rationalism and intellectualism lead us to the irrational rather than the divine (ibid., 9), thoughtful practices in classical Chinese medicine challenge the primacy of Weber’s this worldly/otherworldly divide (which I will discuss further in the next section). Unfolding within the interstices of the Modern, experiments in classical Chinese medicine unsettle some of its most deep-seated assumptions. They challenge a modernistic and imperialistic chronology and geography deceptively premised on radical breaks: the invention of the sciences, the secularization of society, and the mechanization of the world. To be sure, Science and Technology Studies (STS) scholarship in the past 30 years or so have challenged the modernist Great Divides through critical investigations into scientific knowledge production—in the lab, in the field, and at the boundary of popular culture and activism. This body of literature has generated invaluable insights into the sociality of science, reopening the black box of science as epistemological, ontological, and ethical practices deeply entangled in the materiality and politics of difference (in Karen Barad’s words, differences that matter). In the critical studies of traditional Chinese medicine, too, much attention has been paid to, first, how TCM acquired a distinctive professional profile through imperialist and colonial encounters with biomedicine, western science, the state, and modernity (Andrews 2015; Lei 2015; Rogaski 2004; Scheid 2002; Zhan 2009); second, TCM as a set of institutionalized and scientized knowledge and practice (Farquhar 1994; Scheid 2014; Zhan 2009). Taken collectively, however, we (I count myself in here) have also inadvertently reproduced an analytic in which traditional Chinese medicine becomes legible through its proximity to modern science and within the entrapping of secular modernity. But what remains invisible and unthinkable in the kind of STS approach that takes findings in the natural sciences and medicines as their own starting point or framing? Are we too fixated on the power of material science and technology that we end up reproducing what we set out to critique by leaving little room for spirits, wonders, gods, the cosmic, and the ineffable? To bring all this closer to my project at hand, how could we possibly account for the rise of classical Chinese medicine—its call to bring medicine back to life—without falling back on essentialist tropes and origin stories, or subsuming it within universal capitalist logic and scientistic thinking? In the making of classical Chinese medicine, what becomes "worlded"—imaginable, thinkable, representable, and doable—is not alternative ontology or epistemology, but the provisional and multiplicitous nature of our mode of inquiry as well as possibilities for worldly imaginary, connectivity, and inhabitance. The historian Dipesh Chakrabarty argues that even though "European thought" is itself heterogeneous and has a deeply contrary relationship in postcolonial, non-western, and third-world places, it remains "both indispensible and inadequate in helping us to think through the various life practices" that constitute the political and the historical in postcolonial settings (Chakrabarty 2000, 6). Inadequate? Sure. Indispensable? I think that depends on what form "European thought" is worlded. In this essay, rather than claiming European thought as our singular global inheritance, I would like to introduce a few provocations to help us—myself most of all—think alongside the cosmographic experiments in classical Chinese medicine as a set of immanent analytics and worldly imaginaries of thinking, doing, and being. To put it very crudely, my provocations are aimed at probing the limits of the theories and rationalizations of knowledge and identity, and move toward provisional methodologies of orientation, propensity, capacity, and willingness. To paraphrase Donna Haraway’s recent work, I will try to think with, make with, and stay with the trouble for a bit. What might cosmography look like today and how can we reanimate it—one that is committed to phenomena, actions, processes, and events? This essay (and my broader project) is entitled "Cosmographic Experiments." I choose the word cosmographic first and foremost because of my interlocutors’ obvious fascination with the everydayness and ever-presence of the cosmic: from bagua division of a soccer game half of a world away, to observations that the movements and positions of heavenly bodies of our time are extraordinarily similar to what it was like 2000 years ago (which is significant because it was a time when Daoist thinking flourished and classical texts of Chinese medicine proliferated—the golden age of Daoism and Chinese medicine, so to speak). There is nothing inherently grand or abstract in nature or scale about the cosmic. If anything, it is incredibly down to earth: "Dao begets one, one begets two, two begets three, three begets all things. All things carry yin on their backs and hold in their arms yang, harmonized by the movement of qi" (Daodejing chapter 42). Just as important, the cosmographic also has a long history in anthropological and humanistic inquiry (Zhan 2015). The anthropologist Franz Boas proposed cosmography as a science that "considers every phenomenon as worthy of being studied for its own sake" ( 1940, 642). Boas identifies two impulses in the origin of every science: aesthetic (by which he means "rational") and affective (ibid., 643). The quest for law, order, and rationality arises out of the aesthetic impulse, which Boas suggests must have risen out of an earlier desire of developing mankind to find law and regularity in a confusing world (ibid.). (In other words, rationality is a primitive impulse.) Quoting Goethe, Boas imagines a cosmography that follows the affective impulse and finds a single phenomenon, action, or event worthy of attention not because it is explainable but because it is true (ibid.). The affective in Boas’s cosmography is therefore not necessarily opposed to rationality in a binary struggle. Rather, it orients us toward a thoughtful and holistic empiricism that takes phenomenon as its own analytic. The legacy of Boas, the physicist turned anthropologist, and (a-hem) a positivist, resembles nothing like planetary physics. Instead of giving birth to a theory of everything, his cosmographic orientations have helped us keep phenomena alive in anthropological imaginations (Zhan 2015). Even though Karen Barad writes about quantum physics—not Chinese medicine or China—I find her attentiveness to phenomena especially compelling for envisioning a feminist, postcolonial, and nonmodern social analysis of thinking, doing, and being that unsettles rationalization, scientism, and essentialism, and, in so doing, stays faithful to patterns of differential becoming. My point here is not that we need a better theory of knowledge and/or identity. Rather, we need to come to terms with the fact that Theory itself is a dynamic topological reconfiguring/entanglement/relationalitie/(re)articulation of the world—in other words, a phenomenon. What becomes a theory, a philosophy, or an intellectual inheritance is itself a project of rationalization and (sometimes?) a violent (un)worlding. As Susan Buck-Morss (2009) reminds us in Hegel, Haiti, and Universal History, it was by erasing the Haitian Revolution and the actual experience of black slavery that Hegel came up with his treatise on the master/slave dialectic: when Hegel spoke in abstract and philosophical terms about achieving humanity and self-consciousness through a struggle to the death, he not only wrote the Haitian slaves out of the material history of the world (they became barely visible metaphors) but also defended and lengthened a European intellectual genealogy at their expense. Further, as Marx later reworked the master/slave dialectic into his theory of capitalism, he too dwelled on the metaphoric and missed the specificity and materiality of history (ironic, considering Marxist commitment to materialism). What becomes a theory, a philosophy, or an intellectual inheritance is itself a project of rationalization and (sometimes?) a violent (un)worlding. The production of theory, then, is itself a (violent) (un)worlding that renders certain experiences, thoughts, actions, and worlds thinkable, imaginable, and representable, and banishes others to the earth. Where does this leave us? Where does our commitment to Theory leave us? Here I borrow a page from the literary critic Petrus Liu. What we are left with, as Liu recently argued in Queer Marxism in Two Chinas, is a huge distance between Theory/orthodoxy and phenomena—the distance between established analytical categories and actually existing history, alliance, and diversity. In his exploration of nonliberal queer theory, Liu argues that Marxism must be dislodged from its framing as "a monolithic intellectual orthodoxy" and be reimagined as a methodology that "does not take capitalism’s historical development in Europe as its privileged object of analysis" (2015, 8–9; emphasis mine). This requires us to get away from the paradigm of ontological and epistemological pluralism, which is always already grounded in the fragmentation. Suspend hopes for a better theory, better knowledge, or better identity politics as an answer to our troubles. Call upon gods and spirits, if you will, without establishing their ontological realness or epistemological priority. As one of my interlocutors puts it simply: "Give me a little space, and I will do as much as I can with it." What does it mean to be outside of the establishment? Admittedly, classical texts are taught at state-run TCM institutions today. TCM curricula often emphasize the so-called four classics—a cluster of four courses organized around classical texts and topics—each of which represents a "qualitative change" in relation to its predecessor: the formation of basic theory in 内经Neijing, the application of theory to herbal prescription in 伤寒Shanghan, the division of internal and external medicines in 金匮 Jinkui, and close examinations of particular disease(s) in 温病Wenbing. The idea of “qualitative change” comes straight out of Mao Zedong’s essay, On Practice (1937), a treatise on dialectical and historical materialisms that shaped the invention of a coherent system of "medical theory" during the scientization and standardization of TCM. What does it mean to be outside of the establishment? Classical Chinese medicine outside of the establishment also draws on ancient texts. However, they are marked by a self-conscious differentiation from the pedagogical discourses and practices dominating state-run institutions. In focusing on particular analytics in rapidly changing everyday practice rather than the evolution of Chinese medical theory, tizhiwai classical Chinese medicine is much less committed to the developmental scheme of dialectical and historical materialisms or invested in coming up with a theory of everything. In fact, it makes a point of embracing esoteric pre-Daoist, pre-Confucian, and Daoist texts beyond the parameter of the four classics—for example, the pre-Daoist and pre-Confucian text Zhouyi and Daoist texts such as Laozi and Zhuangzi. Zhouyi, in particular, systematically spelled out specific manifestations of gua (trigrams) and, more importantly, how to interpret the cosmic dynamics of all worldly beings and events as they unfold. Nothing is too big or too small to know. Inquiries and interpretations are always provisional and are themselves part of the unfolding. Such conceptions of the cosmic oneness, multiplicitous actualization, and dynamic continuity of all beings are significant in the discourses and practices of health, body, self, illness, and healing. Experiments in classical Chinese medicine are therefore much larger, more imaginative, and more provocative than the resurrection of the ancient or reinserting the religious or spiritual back into TCM theory (Zhan 2016). "Religion" is admittedly making a comeback as temples, shrines, churches, pilgrimages, and life cultivation practices of various faiths and convictions proliferate across China. Vernacular and academic discourses on religious revival in postsocialist China have often emphasized the ways in which religion and spirituality have come to occupy the moral-ethical vacuum left by the failure in communist ideology and the onslaught of global capitalism. Yet this kind of explanation rests upon the modernist practice of purification (Latour 1993) that creates religion as a distinctive ontological, epistemological, and ethical domain in the first place. Within this modernist framework, "religion" or "spirituality"—once artificially separated from the secular and the material—is made to play a secondary role to the universal logic of capital and capitalism (Zhan 2016). In the case of classical Chinese medicine, the "religious turn" does not adequately explain why it thrives at this particular moment in cosmopolitan China, or why it elicits impassioned support and following among the young entrepreneurial generations that position themselves outside of the establishment. Marx, for example, famously dismissed religion as the opium of the people. Weber, on the other hand, adopted a more hermeneutic approach to modern capitalism by considering its religious origins. In The Religion of China: Confucianism and Taoism, written immediately after The Protestant Ethic and the Spirit of Capitalism, Weber explored how Chinese "religions" prevented the emergence of ethical entrepreneurship and therefore capitalism in China. Confucianism, according to Weber, was steeped in rationalism but lacked the otherworldly "calling" that defines the Calvinist ethic. Daoism was even more "traditionalist" for its rejection of rationalism and thorough immersion within otherworldly mysticism. Interestingly, the only way that Daoism entered this-world was through the practice of the so-called magicians—geomancers, fortune tellers, alchemists, healers, among others—whom Weber considered the worst kind of unethical swindlers and the antithesis of the modern capitalist spirit. By resting his analysis of capitalism on the otherworldly/this-worldly divide—Weber actually missed an opportunity for a comprehensive cultural analysis of capitalism that would actually stick. In the end, it was only all too easy to leave religion and culture locked outside of the iron cage of rationalism. In the case of classical Chinese medicine, the "religious turn" does not adequately explain why it thrives at this particular moment in cosmopolitan China, or why it elicits impassioned support and following among the young entrepreneurial generations that position themselves outside of the establishment. Tizhiwai advocates of classical Chinese medicine are keenly aware of the market allure of "tradition" and "spirituality" as translocal cultural productions, and in accentuating classical texts and concepts in Chinese medicine, entrepreneurial practitioners are conscious of crafting a particular niche, a clientele, and a set of commodities amidst competitions with biomedicine and TCM institutions. These practitioners are remarkably market savvy and resilient as they navigate the complex and fast-changing and unpredictable healthcare market, government policy, and bureaucratic system. Some already enjoyed success in other kinds of businesses, but many told me that they ultimately failed to find personal gratification or fulfilment in "marketing" in and of itself. "I did not believe you when you told me to go on a vegetarian diet after completing the seminar. I was a carnivore and I thought I was going to die. Now I feel great and I want to become a vegetarian! This is the lesson I learned: I am a lowly grass-chewing cow. Why did I dream of being a carnivore?" The reference to the hierarchy of lives and the survival of the fittest is unmistakable here. However, those familiar with Daoist texts would instantly recognize the reference to the Daoist sage Zhuangzi’s famous butterfly dreams. Zhuangzi dreamt of himself as a butterfly, "happy with himself and doing as he pleased" (Watson 1964:45). When he woke up, "There he was, solid and unmistakable Chuang Chou. But he didn’t know if he was Chuang Chou who had dreamt he was a butterfly or a butterfly dreaming he was Chuang Chou. Between Chuang Chou and a butterfly there must be some distinction! This is called the Transformation of Things" (ibid.). An egalitarian minded reader would be tempted to interpret Zhuangzi’s mystic dream to mean that all things in the world are essentially interchangeable if not commeasurable. However, this interpretation would miss Zhuangzi’s emphasis on transformation accentuating the continuous actualization of all beings: or rather, their differential coming into the world from the ineffable non-being or Dao. Dao continuously unfolds through all temporary beings in the world, whether butterfly, Zhuangzi, cow, or in some other form. Just as important, rather than a narrative of peace and harmony, the patient’s analogy of Zhuangzi’s butterfly dream is about the deep-seated difference and inequality of conditions of being in the world. Within China’s translocal and changing sociopolitical landscape that has created both the aspirations and precarities of the urban middle-income consumer-producers, his comment is especially poignant. The butterfly story thus speaks of the centrality of differential becoming and patterning in the making of the world and our places in it: a provisional methodology for approaching materiality without material, inhabiting immanent modes of thinking, doing, and being without mechanized theory, being able to call on the spiritual without having to establish its ontological realness or priority, and bringing forth nonmodern possibilities into the world from deep within the interstices of the Modern. The interpretation, translation, and enactment of classical analytics in classical Chinese medicine, then, is not simply a matter of mistaken ontology or quackery. It is about the patterning of relations that traverse abstract and concrete, theory and phenomenon, substance and process. Even as we get pulled toward Theory and its creation and ordering of seemingly distinctive epistemological and ontological domains, phenomena retain critical possibilities for imagining multiplicitous and undivided ways of being in the world. These possibilities cannot not be found or resurrected by a simple return to the pre-modern world or its ways of knowing and being. Rather, in order to keep these possibilities alive we need to look past Theory and try to co-imagine a critical methodology of continuous unfolding and differential becoming. A word that has multiple Buddhist, Daoist, counterculture, and New Age connotations and gaining attention as a health practice in the United States. So, in other words, this is not about looking for alternative arboreal genealogy but rather challenging the very idea of genealogy and inheritance itself. Similar critiques have been articulated by a wide range of historians, anthropologists, and literary critics. See, for example, Marshall Sahlins’s critique of the world system theory, David Eng’s critique of humanism, and Lisa Lowe’s and Laura Doyle’s critiques of world history. Andrews, Bridie. 2015. The Making of Modern Chinese Medicine, 1850–1960. Durham, NC: University of Hawaii Press. Boas, Franz. (1887) 1940. "The Study of Geography." In Race, Language and Culture, 639–47. New York: Free Press. Buck-Morss, Susan. 2009. Hegel, Haiti, and Universal History. Pittsburgh, PA: University of Pittsburgh Press. Chakrabarty, Dipesh. 2000. Provincializing Europe. Princeton, NJ: Princeton University Press. Farquhar, Judith. 1994. Knowing Practice: The Clinical Encounter of Chinese Medicine. Boulder, CO: Westview Press. Latour, Bruno. 1993. We Have Never Been Modern. Translated by C. Porter. Cambridge, MA: Harvard University Press. Lei, Sean Hsiang-lin. 2015. Neither Donkey nor Horse: Medicine in the Struggle over China’s Modernity. Chicago, IL: University of Chicago Press. Liu, Petrus. 2015. Queer Marxism in Two Chinas. Durham, NC: Duke University Press. Rogaski, Ruth. 2004. Hygienic Modernity: Meanings of Health and Disease in Treaty-Port China. Berkeley, CA: University of California Press. Scheid, Volker. 2014. "Convergent Lines of Descent: Symptoms, Patterns, Constellation, and the Emergent Interface of Systems Biology and Chinese Medicine." East Asian Science, Technology and Society 8 (1): 107–39. ___. 2002. Chinese Medicine in Contemporary China: Plurality and Synthesis. Durham, NC: Duke University Press. Watson, Burton. 2013. The Complete Works of Zhuangzi. New York: Columbia University Press. Weber, Max. (1918) 1946. "Science as a Vocation." In Max Weber: Essays in Sociology, translated and edited by H. H. Gerth and C. Wright Mills, 129–56. New York: Oxford University Press. ___. (1915) 1951. The Religion of China: Confucianism and Taoism. Translated and edited by Hans H. Gerth. Glencoe, IL: Free Press. ___. (1930) 1992. The Protestant Ethic and the Spirit of Capitalism. Foreword by Anthony Giddens. New York: Routledge. Zhan, Mei. 2009. Other-worldly: Making Chinese Medicine through Transnational Frames. Durham, NC: Duke University Press. ___. 2012. "Worlding Oneness: Daoism, Heidegger, and Possibilities for Treating the Human." Social Text 29 (4): 107–128. doi:10.1215/01642472-1416109. ___. 2014. "The Empirical as Conceptual: Transdisciplinary Engagements with an ‘Experiential Medicine.’" Science, Technology, & Human Values 39 (2): 236–63. ___. 2015. "Tales of Physics and Cosmographies of Capitalism," Cultural Anthropology Online, March 30, 2015. https://culanth.org/fieldsights/657-tales-of-physics-and-cosmographies-of-capitalism. ___. 2016. "The Empirical as Conceptual: Transdisciplinary Engagements with an ‘Experiential Medicine.’" Science, Technology, & Human Values 39 (2): 236–63. ___. 2018. "Out of Nothing: (Re)worlding "Theory" through Chinese Medical Entrepreneurship." In The World Multiple: The Quotidian Politics of Knowing and Generating Entangled Worlds. Grant Jun Otsuki, Shiho Satsuka, Keiichi Omura, Atsuro Morita, eds. New York: Routledge. Žižek, Slavoj. 2014. Event: Philosophy in Transit. New York: Penguin Books. This essay builds on and further develops arguments presented in "Cosmic Experiments: Remaking Materialism and Daoist Ethic ‘Outside of the Establishment’," Medical Anthropology 35 (3); and in "Tales of Physics and Cosmographies of Capitalism," Cultural Anthropology, March 30, 2015. https://culanth.org/fieldsights/657-tales-of-physics-and-cosmographies-of-capitalism.